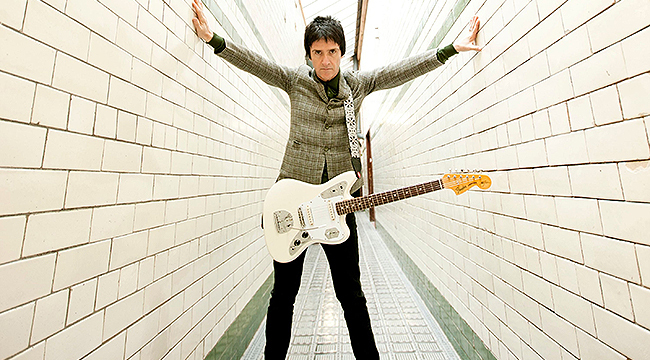 A founding member of the Smiths, Johnny Marr is a phenomenal guitarist whose retro-sounding style of playing defined the British band’s tunes as much as Morrissey’s vocals did. After stints with The The, Modest Mouse and the Cribs, to name just a few of his moonlighting gigs, Marr has now finally released his first solo album, The Messenger. He phoned us just after show in Scotland to discuss the album and his upcoming tour. NME just gave you an award for being a “Godlike Genius.” What was that experience like? That was a fun night. Everybody gets together, and it’s quite lively. You have to remember to stay focused because at the end of the night if you win that award, you have to play to a roomful of people. I got Justin [Hayward-Young] from the Vaccines to come up and do a number with us. It was a fun night. I don’t take those things too seriously but it’s nice. It’s better than winning the “Best Villain” award. Yeah, you never know. There’s still time. I like the album cover. Where was that photo taken? Let’s put it this way. You listen to so many records late at night with a glass of wine and a joint. My record isn’t that. I think it’s appropriate because it sounds like you’re having fun playing those songs. Thank you. It was important to me that the record was something you could listen to in the daytime, and it made sense. Let’s put it this way. You listen to so many records late at night with a glass of wine and a joint. My record isn’t that. It’s the opposite. I wanted to make a record that sounds good on the bus or the way to work or on your way to school or on your headphones walking to the bus. The bands that influenced me were the bands I listened to when I was in school. Bands like the Buzzcocks and Television gave you a kick. It’s hard to make music like that and for it to be cool. If jukeboxes still existed, I wanted every song to sound good on the jukebox. I want them to be good at the beginning, middle and end and not be too long. I wanted it be something that every cut would be good live. That was my main consideration. The other consideration is that fans like it. It was really natural. I didn’t worry about how it would measure up against my old stuff or what critics would make of it or how it measured up against other bands. I cross my fingers and hope that I got it right. I didn’t expect it to get the attention it has gotten. You put as much work into it as you can and hope for the best. You moved back to England to record the album. What prompted that decision? I would have enlisted the services of my fellow musicians in Portland, and there are a lot of them, and that would have changed my influences around a lot. I have this notion, almost a superstition really, that if I went back to the UK, that it’s a good place to get uptight. I wanted it to not be too relaxed. I didn’t want to make an angry album but I thought I would be too relaxed in Portland because I’m not from there. I tend to move around that city like a ghost. In the UK, there are things that get under my skin. Being around so many of my friends in the States, I started to view the UK as being a part of Europe the way my American friends did. In a lot of ways, we take that for granted in the UK. Most of my American friends assume I spend more time in Paris than I do. Because I was in America for five years, I saw the UK for what it is. That’s why there’s a song there called “European Me.” I’m reconnecting with Europe. I went to Berlin to do the vocals. I spent time in Paris when I was writing. I like the cities and buildings and I’m not necessarily talking about old quaint churches and castles or stuff like that. I like the post-war architecture. I had these mental post-it notes that I needed to turn into songs. People are so concerned with a soulful kind of earnestness and that wasn’t going on when I was growing up. Your vocals on “Sun & Moon” sound great. Was it difficult to nail that song? Yeah, that was one of a few songs that I went out and played live to get them down. That was one of the songs that benefited from it. I’m happy that you like it. It has an electro synthesizer on it. I tuned my guitar right and sang it in a more rock ‘n’ roll fashion. That’s how I like to sing, to be honest. You don’t hear a lot of people singing that way now. People are so concerned with a soulful kind of earnestness and that wasn’t going on when I was growing up. That kind of balladeering was scoffed at when I was forming bands. I like to sing in a punchy way. You’ve always had a very distinctive way of playing. Talk about how you developed your own unique sound? It’s mostly just accident and not being interested in playing any other way. Growing up in the ’70s, that was a time when my friends were into rock music and I was more interested in pop music which back then was made by people who played guitar. There’s great guitar on the Sweet records and the T. Rex records. The only rock guy that I liked was Rory Gallagher. I didn’t like Led Zeppelin until I was in my thirties. I always appreciated Jimmy Page for his compositional skills. It didn’t sound like exciting music to me. I was obsessed with 45s and 7-inch singles. It’s like a religion. I was in love with guitar culture too. I would hang out in guitar shops like anybody else. I would draw guitars in my school books and the whole bit. When new wave and punk came around, that was my rock ‘n’ roll. I remember liking Blondie and [Television’s] Marquee Moon had great technical guitar playing that had some intelligence about it. I tried to play these pop 45s and make as big as noise as I could. I didn’t want to use blues scales or do solos. All the records I liked were shorter than the solos Deep Purple were playing. When I was with the Smiths, I wanted to write songs in some weird ways that sounded like the girl groups or maybe some Supremes b-sides. That was what I was trying to do when I started out. Baltimore, MD – Rams Head Live!